Nostalgia World brings you a steal of a deal. 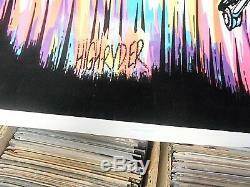 Featured is a very cool HIGH RYDER blacklight poster measures 23"x35" released in 1973 marked DARGIS #3297. Solid FINE condition please check scan. MUST HAVE FOR ANY FAN! Please check the scans because what is pictured is exactly the item you will receive. Please view our store items for other collectibles. 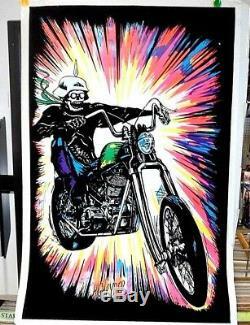 The item "HIGH RYDER Hog Rider CYCLE Blacklight Poster 1973 DARGIS #3297 Vintage SKULL" is in sale since Friday, March 23, 2018. This item is in the category "Art\Art Posters". 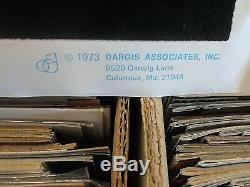 The seller is "nostalgia-world-wi" and is located in Milwaukee, Wisconsin. This item can be shipped to United States, Canada, United Kingdom, Denmark, Romania, Slovakia, Bulgaria, Czech republic, Finland, Hungary, Latvia, Lithuania, Malta, Estonia, Australia, Greece, Portugal, Cyprus, Slovenia, Japan, China, Sweden, South Korea, Indonesia, Taiwan, Thailand, Belgium, France, Hong Kong, Ireland, Netherlands, Poland, Spain, Italy, Germany, Austria, Israel, Mexico, New Zealand, Philippines, Singapore, Switzerland, Norway, Saudi arabia, United arab emirates, Qatar, Kuwait, Bahrain, Croatia, Malaysia, Chile, Colombia, Costa rica, Dominican republic, Panama, Trinidad and tobago, Guatemala, El salvador, Honduras, Jamaica, Antigua and barbuda, Aruba, Belize, Dominica, Grenada, Saint kitts and nevis, Saint lucia, Montserrat, Turks and caicos islands, Barbados, Bangladesh, Bermuda, Brunei darussalam, Bolivia, Egypt, French guiana, Guernsey, Gibraltar, Guadeloupe, Iceland, Jersey, Jordan, Cambodia, Cayman islands, Liechtenstein, Sri lanka, Luxembourg, Monaco, Macao, Martinique, Maldives, Nicaragua, Oman, Pakistan, Paraguay, Reunion, Bahamas, Uruguay.